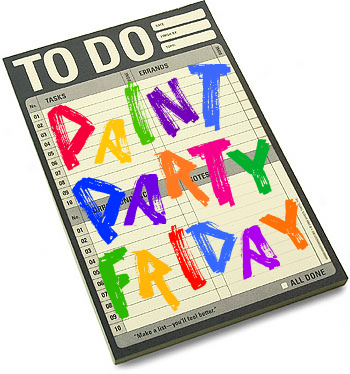 Welcome to the first of the Summer editions (or Winter - for our players in the Southern hemisphere) of Paint Party Friday! It is great to have you here! Last week we talked about challenges, prompts and themes. Thanks for all the great ideas! We haven't had much time this week to update the page we created to help with inspiration and motivation - but we've started. Meanwhile, if you think of others, please email us or mention them in the comments. Most of you use prompts etc when one compels you, though a good number of you have never met a challenge or prompt that you didn't like! In the comments a number of you said "PPF is all the challenge I need." Wow!! Thank you SO much! We are thrilled PPF is helping you paint more! This week, our thoughts turn to the changing seasons. Summer is here - Yay!! And that makes us wonder if the seasons affect your painting productivity? Tell us more in the comments about what season works best for you and why! Hope the new season is treating you well and that you have a fun time at the party! 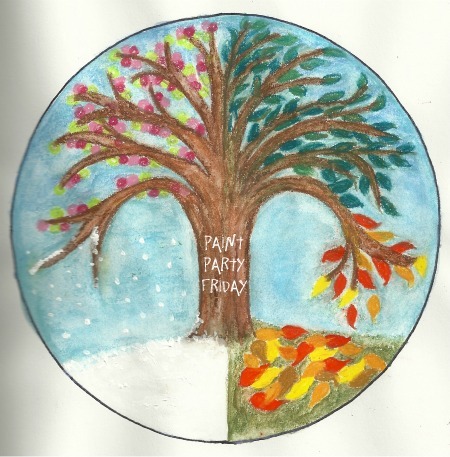 Welcome to Week 14﻿ of Paint Party Friday! We had such a great time last week with your wonderfully insightful comments!! It's great to have you back or joining us for the first time! Last week we were musing about Muses. And it was very interesting and fun! A slight majority felt they had a muse or many muses - whether invisible, the invocation of family members' spirits, pets, your children or some muses who are currently AWOL. Some of you were unsure or even scoffed at the idea of a "muse" but there was little doubt of your OWN creative force shining through in your painting. We were also thrilled and impressed with how many people actually read the comments as we went off on a tangent that will continue here this week. We, and even muses, sometimes need prompts and challenges to boost or jump start our creativity and painting efforts. That's what we'd like to explore further in this week's poll and we hope, in all your comments. and probably a few others. These are great fun! But none of them was about painting. Thus Paint Party Friday was born. From the comments we had last week the feedback was overwhelming to keep PPF as is - no themes or prompts. "It's like a great virtual Open Studio Day here, and I love it." was one of the comments - Thank you! What a lovely description! Prompts, themes and challenges can be amazingly important to keep many of us inspired and productive - so we want to know about your favourites! And we especially want to know if you host one! * Tell us what you love, what's fun and what really works for you. We will create a page that anyone can visit as needed if their creative fuel starts running low. And here's the check-in! If you are unfamiliar with Mr. Linky, an explanation of how this tool works can be found on Week 1 and Week 2 check-ins. Please make sure to use your post URL address versus your blog URL address as there are many late visitors who get confused as to which post is for PPF when they arrive (after Friday) at your website. Do you host one we haven't mentioned yet? Please tell us more! 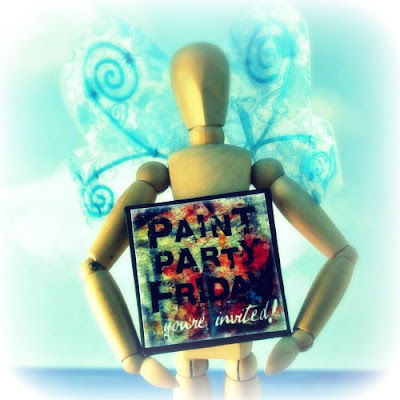 Welcome to this week's Paint Party Friday! It's wonderful to have you here for PPF, especially as the weather in the north tempts many of us away from our paints and into the long awaited sunshine. Last week we talked about your creative process and how you start your art. Paint Party Friday players (PPFers) are a versatile (and talented) group! You have either tried everything or you fly by the seat of your pants - which some might say involves trying ANYthing. In your comments and posts, the underlying theme of the Muse keeps arising. Otherwise known as - the little spirit (as NatashaMay described), the divine, the voices, my invisible friend as SunshineShelle created or Creation (who Victoria Pettella says owns her) - the Muse seems to hang out with PPFers. 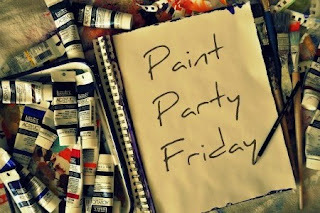 BTW, if you have ever painted or wanted to paint your Muse, we would love to see what you have painted or will create! And finally - the check-in! If you are unfamiliar with Mr. Linky, an explanation of how this tool works can be found on Week 1 and Week 2 check-ins. Please make sure to use your post URL address versus your blog URL address as there are many late visitors who get confused as to which post is for PPF when they arrive (after Friday) at your website. Welcome to Week 12 of Paint Party Friday! (Can you believe we've been doing this for 3 months?!?) This continues to be one of our favorite places to be... We are so happy to see so many friends returning and we're thrilled to meet new painters each week! Last week we discussed distractions and creative blocks and asked how you deal with them. There were many different ways we all get through them but it seems most of us try to keep the creativity going no matter what. Hooray for perseverance! This week we're curious about your creative process. Some of you have talked about your process on your posts and others have shown us photos and videos! It is fascinating to see and experience other artists' work in progress and to discover the way that you create what you create. So we are curious about how you do what you do and especially how you start. Tell us more - in the poll, in the comments and in your posts!